The skid control ECU is connected to the combination meter via CAN communication. The slip indicator light blinks during VSC and/or TRAC operation. When the system fails, the slip indicator light comes on to warn the driver (See page ). (a) Check if a CAN communication system DTC is output (See page ). (a) Check if the skid control ECU connector is securely connected. The connector is securely connected. (a) Check the battery voltage. (a) Turn the ignition switch to ON and check the slip indicator light will come on for approximately 3 seconds (initial check). 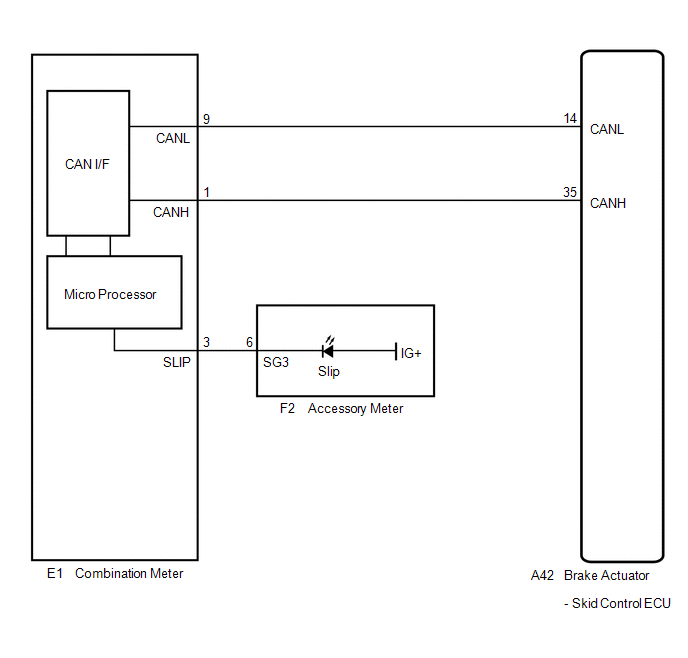 (b) Perform the Active Test of the combination meter (meter CPU) using the Techstream (See page ). (c) Check the accessory meter. If troubleshooting has been carried out according to Problem Symptoms Table, refer back to the table and proceed to the next step before replacing the part (See page ).